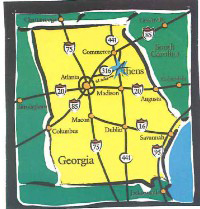 Athens is located in Northeast Georgia, just 61 miles northeast of Atlanta. Atlanta&apos;s Hartsfield-Jackson International Airport is easily accessible via Groome Transportation, which operates 19 trips daily. Additionally, Athens is served by Megabus. Athens-Ben Epps Airport provides facilities and services for both commercial and general aviation operations, including charter service.